Well, it’s that time of year again. Leaks and prototype drawings are starting to slip out the shipping entrance of the various fly-fishing manufacturers. Fortunately, some companies have decided to dispense with the suspense and just tell the world what they’ve got coming at the Fly Fishing Retailer Show (September 9-12 in Denver). Nautilus is an interesting company to say the least. Owned by the European Mustad family (it’s hard to say exactly where in Europe they’re from, since the owners speak about six languages, but at any rate they’re cousins of the Mustads who own the hook company), the company started as Old Florida, which you may remember was famous for its heavy-duty brassbound reels and affordable pricing. Old Florida’s introduction of the “Nautilus” lineup of reels was such a runaway success, the company shifted identities and made ‘Nautilus’ the focus, effectively changing names in the process. 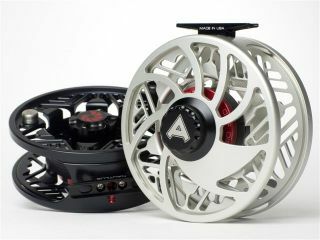 Nautilus has three main lines of reels: the (original) Nautilus CCF, a synthetic-drag, high-end machined big game reel, the Nautilus FW (featherweight), a lighter lineup for freshwater use, and the ultra-high end Nautilus NV, which carry larger synthetic drag surfaces than the CCFs and are noticeably smoother with line going out. In the last two years Nautilus has entered the bluewater market with gusto, first with the “Double D” – a twelve weight monster, then with the 12T and 12S, successively larger versions capable of holding almost a half mile of gelspun backing. All three are built on oversize CCF drag cores. The new reel is the largest Nautilus has ever built: the “Atlantic“, rated for 475 yards of dacron backing (double or even triple that for gel-spun), with a full five inch diameter. In addition to bluewater, Nautilus expects this reel to be very popular with Scandinavian Spey fishermen, who need huge reels both to balance their long rods and to hold the massive sinking Spey line systems popular in Norway and Sweden. The Atlantic will cost $795, with spare spools a comparatively cheaper $295. Have a method for rigging your bluewater reels as drift boat anchors in the off season? Share it with us in the Comments section!